How many times have you said to yourself (or heard another writer say) “This would be so much easier if I could quit my job or work part time.” That used to be me. Having lived on both sides of this fence, I feel those of you still in the day job should know something. It’s a myth. For one thing, most of us have a maximum words we can get out each day. For some that’s 500, for others it’s 5000, but whether you work or not, that number is not likely to increase much. In other words, time does not equal capacity. Also, resistance remains, but now there are different distractions that resistance can use to keep us from the page. Errands, phone calls, housework, all of these things are still present and even more likely to distract you when you aren’t so focused on getting your writing in. It’s too easy to fall into the thought that you can write later because you have all day. Discipline is required when your schedule is wide open. Here’s another element that isn’t often discussed. Having a job gives your writer mind time to ruminate and work on the story while you work. It distracts you in good ways so your word well fills up and you’re ready to go for your next writing session. Without work, we need to create that distraction. There are some good things about writing full time. One is that you end up with more time to daydream or cultivate the good kind of mindlessness with chores, walks, and what have you. The other advantage is that you are often able to write during the time of day you are most creative and energetic. However, establishing a routine when you first leave your job is absolutely vital or your days will fill with everything but writing. I’ve held high-stress jobs with evening meetings and I’ve held jobs where I was on my feet 12 hours a day and on call 24/7. I had no life outside of work because I spent my spare time writing. Now that I’m not working outside the home, with lots more spare time, I have only been able to push my capacity by 1000 words a day. If I had the means, I think I’d volunteer somewhere a few days a week or get a part time low stress job to get me away from the computer and give writing time more of a sense of urgency. Some of us just work better that way, I think. The best jobs I had in terms of writing well were jobs that involved routine tasks that didn’t take a lot of brain function. My hands were busy while my mind was free to plan stories. If you have a job like that and your writing is going well, be thankful. It’s a win-win. If you have the support, the money, and the desire to give up your day job to write full time, you need to know that discipline is required. Routine is important. Motivation is key. And even if all three of these things fall into place, you likely won’t produce much more in terms of word count than you did while you were working. Only you can decide if giving up the day job is worth it, especially if you aren’t making money with your stories. A stimulating job can give you more to write about. A repetitive job gives your brain a lot of freedom. Any job can give you a better sense of urgency to keep your dates with the page. Make your own list of pros and cons, but do it with eyes wide open. How do you think life would be different if you could write full time? If you are no longer working, what’s been the most difficult aspect? Habits can be both good and bad depending on whether they serve your writing habit or create hurdles for it. 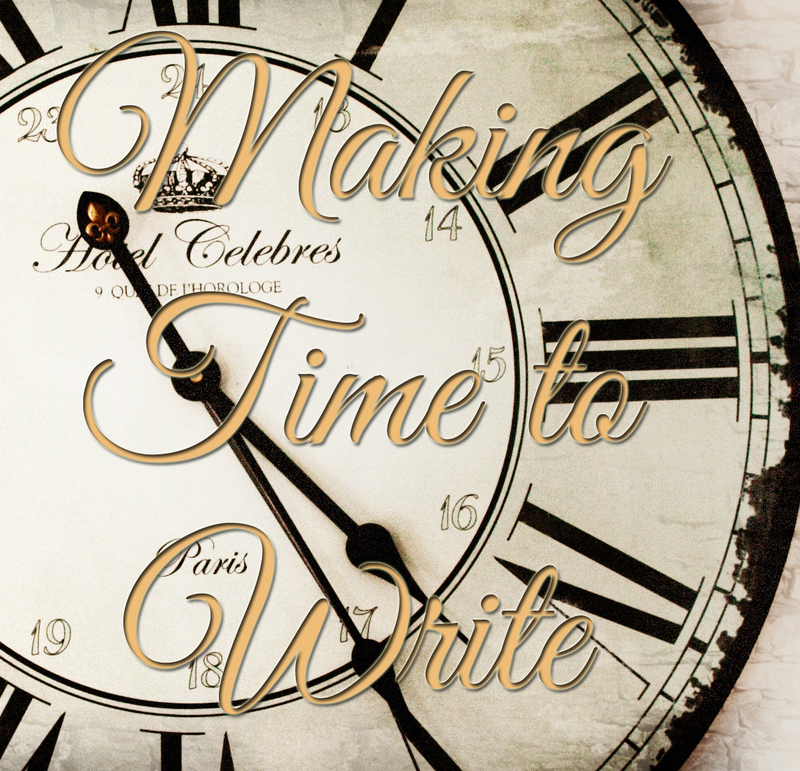 Today we’re going to talk about good habits and how they help us make time to write. When I maintain the writing habit, I get antsy if I haven’t written. It’s a feeling of anxiousness that I’ve forgotten something important. It works for me, though I know it doesn’t work for everyone. Once I’ve spent time writing, there’s a sense of relief. This sense of leaving something undone lets me know that my good habits are still working. When I lose that feeling, I know it’s time to figure out where I strayed off the path and get back on it. When I feel it, I’ll make time to do it. You go to the computer or your writing space without thought or planning, often at the same time each day. You feel the nagging sense of missing something until you sit down to write. You find you are unconsciously ordering your day or environment to allow writing time. You are driven, sometimes physically agitated, until you have a pen and paper in your grasp and are laying down words. You recognize an excuse when you see one. Resistance is a real thing for most writers and I find habit can help me overcome resistance to a large degree. Resistance is higher when I’m tired there’s a lot of life going on. Keeping good habits is especially hard when my schedule is in flux, as it has been for the last few months. The majority of conversations I have with writers in terms of habit maintenance usually involve changes in schedule. Most of the conversations with new writers are about resistance. We need to set guides for ourselves to create and maintain the good habits that support writing. After decades at this craft, I know how easy it is to let a habit slide and how hard it can be to establish again. Over the years, I’ve created some benchmarks to gauge when I might be slipping. Note, these are my benchmarks. They may not work for you, but you can develop some that do. I keep track of my word count and pay attention when volume slips. I am accountable to my critique group and they frequently ask if I’m writing. I read over my writing journal and highlight times I’ve missed writing and make myself explain why. If the excuse doesn’t hold up, I pay more attention until I’m back on track. I set deadlines and weekly word count goals. Once you know you can write anywhere and at almost any time, you’ll find you make fewer excuses for not getting at least a minimum word count every day. My preferences are still there, and yours will be, too, but knowing we can get the work done goes a long way (and sometimes it’s easier to overcome resistance if we just scribble a few lines when we can instead of sitting down for an hour-long session). Sometimes life conspires to keep us from the page. You’ll have to decide for yourself if the circumstances warrant easing up on your expectations. Because I count all forms of writing (blog posts, journal, projects, etc. ), I don’t worry as long as my volume is consistent. That allows for more journaling when life gets in the way and more projects when there’s smooth sailing. When life happens, just be aware you might need to re-establish your good habits and make a plan to do so as soon as the smoke clears. What are your tricks for maintaining healthy writing habits? Where do you struggle? For you in the younger demographic, I’m certain this is old hat for you. Those of us with a little more “experience” might find a few nuggets here. Becoming portable is a boon for writers, and these days there are so many options. Portability not only gives you the advantage of using time that would otherwise be lost (waiting rooms, soccer practice), but also helps eliminate your dependence on a certain place in which to write. I’m including the portability tools I know personally. Please feel free to add to the list in the comments. My phone has a stylus and allows me to write, either in the S Note app or in Polaris (MS Office for Android) and upload to my computer later. It’s slower than typing since the last software update, but reasonably accurate and useful. You don’t have to use the stylus, either. If you are faster tapping on the virtual keyboard, you can generate some decent speed. I have an android tablet with a case that includes a small keyboard. What it’s not as comfortable to type on as a regular size keyboard, it’s doable and I can get quite a bit down on paper with more speed than my phone. Again, I upload to my computer later since I work primarily in Scrivener. It’s a simple copy/paste to move it over. My old laptop was heavy and didn’t have Word on it, so I only took it if I were going to a coffee shop or some place I could use a table. The new laptop (gift from Hubs a couple months ago) is lighter, has a larger keyboard, and is much easier to tote around, sit on my lap, and use in a variety of settings. The new laptop is connected to Dropbox, has Scrivener and MS Office installed, and has made a nice difference both to portability and to working in other parts of the house. Despite my portable devices, I still carry a notebook and pen in my purse and use them often. Sometimes I just need to physically write something by hand in order to work it into my memory. Sometimes I play with words or jot down story ideas. When caught unexpectedly in a waiting room, I wrote whole scenes in a little 4 x 6 inch notebook. I also carry my regular spiral notebook any time I know I’ll end up waiting. Anne Lamott carries index cards in her back pocket while she’s walking. So does Jeff VanderMeer, using them to jot notes when he’s away from his computer. You can write whole scenes on the go or just sketch out what you want to write next. Jot down new ideas if that’s all you want to do. Having the means to capture these ideas in a convenient and habitual way gives you a lot of freedom and positively affects your productivity. What is your favorite way to write when out of the house? Most people can cut down (or cut out) television and some internet and gain sufficient writing time. But what happens if you’ve already pared that down? We’ve talked about using time spent in waiting rooms and during children’s practices before. Let’s talk about less obvious hidden time. These are the moments you can steal for your writing without stealing from other obligations. Last week we mentioned using your commute, and it bears repeating. If you are not able to eliminate or reduce your commute, use the time the best you can, either by writing on the bus or train, or using a digital recorder while you drive (safety first, of course!). If you are big into sports, keep a notebook handy for half-time and replays. If you help your children with their homework, bring your writing to the table and work on it in between questions. Use the time waiting for meetings or classes to start to jot bits of dialogue or mind map the next scene or two. Set up your laptop on the kitchen counter and poke away at editing or writing while you stir the pot (DO NOT do this while frying bacon. Bad for the laptop!). Delegate setting the table and chopping vegetables to other family members to squeeze in an extra fifteen minutes. Get up at the same time every day, including weekends. Let the rest of the family sleep in while you write. Take a notebook to bed and write until you fall asleep (use aerosol hairspray to get ink out of the sheets). Write on your lunch break. Prevail upon your household to help clean up after dinner and organize their belongings for the next day. Use the time you would have spent doing these tasks yourself to write. If you are a passenger on a drive lasting at least fifteen minutes long, write. Stay after work for thirty minutes to write (bonus: there may be less traffic on the road when you leave), or get to work thirty minutes early. Use a digital recorder to speak your material while doing household chores. Keep something handy for writing any time you are waiting. Finding hidden time to write is as much a matter of perspective as it is a matter of practice. The more you open your eyes to the possibilities, the more snippets of time you can find. What is your favorite way to squeeze in extra writing time?